Isn't it great to wake up to this view? The Great Orme, the Grand Hotel and Llandudno Pier. We're heading in that direction after breakfast. The weather today is a bit duller than it was yesterday, but it's still pleasantly warm and the temperatures have to rise as the week goes on. 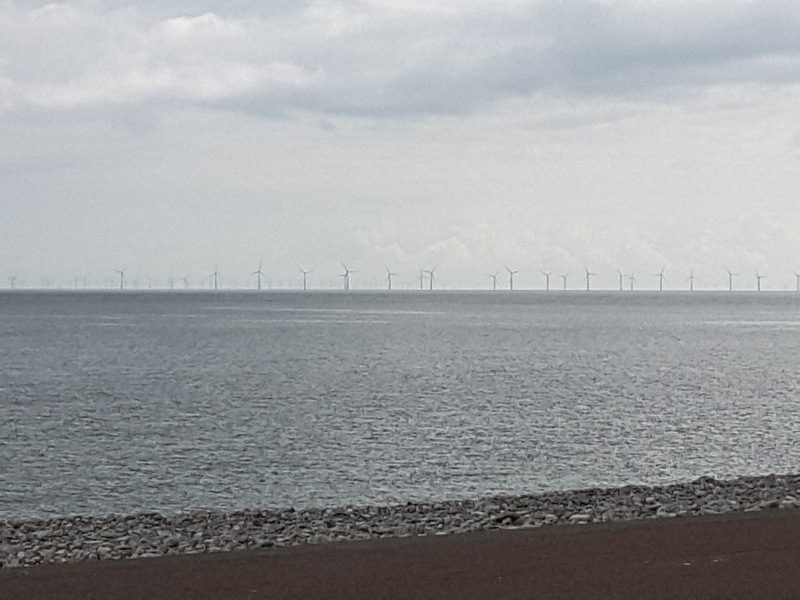 One other familiar sight on the seafront is the Rhyl Flats Offshore Wind Farm, which is actually 8km north east of the 'Dudno. That's the only modern concession to the seafront though. Llandudno promenade is sedate rather than raucous, with no sign of all the usual seafront souvenir shops etc. You have to head all the way up to the Pier before you come across candy floss, fast food and seaside souvenirs. 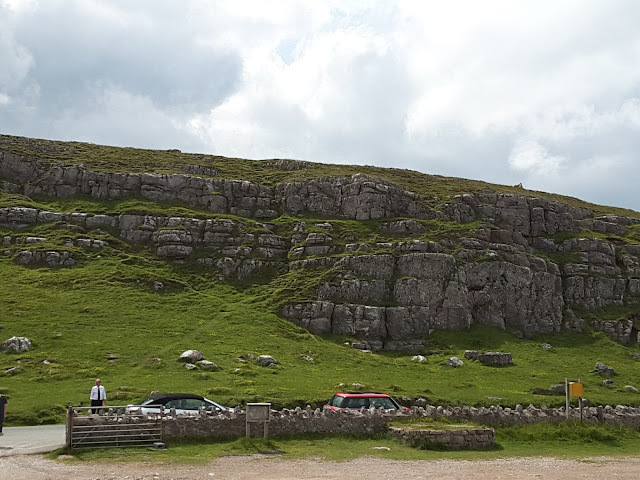 Today we're taking the Marine Drive tour in a vintage coach ride up the Great Orme, This is the limestone headland (above) which dominates the Llandudno landscape. It is an authentic old coach (above) complete with original seating. The driver also provides an entertaining and very informative narration throughout the journey. 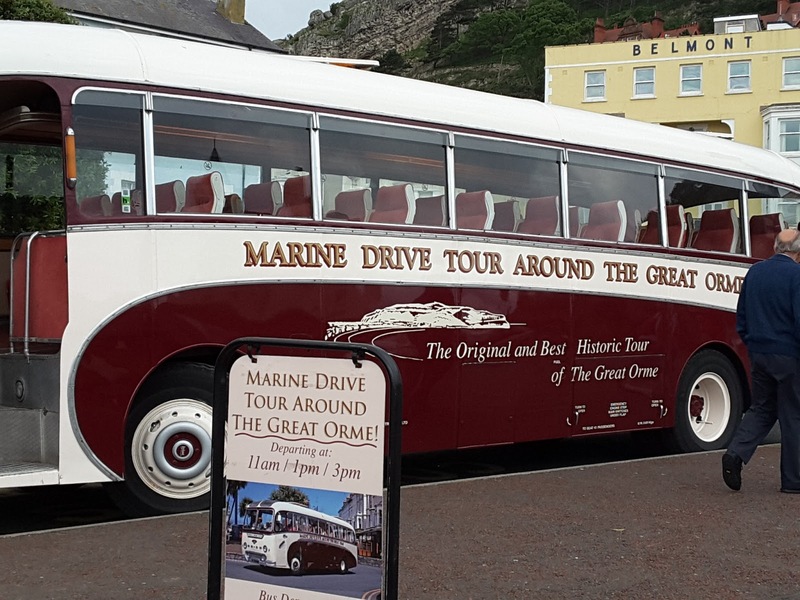 The coach leaves from next to the Pier and begins to climb up the Orme. Having travelled on the corniche in the South of France, and along the Dalmaian Coast in Croatia, I can honestly say that this journey rivals those for thrills and spills, narrow scary roads, high mountains and stunning coastal views. 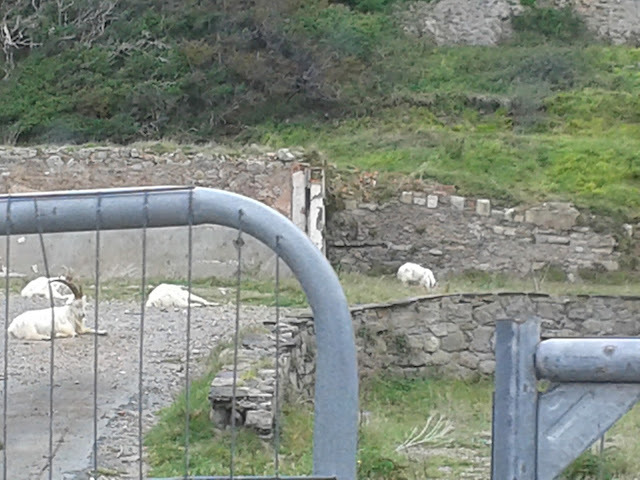 We are particularly interested in spotting the goats who live on the Orme. It's well-populated by sheep too, but the goats are harder to find, although they eventually make an appearance...here are some from later on in the journey. We have a stop at the 'Rest and Be Thankful'. 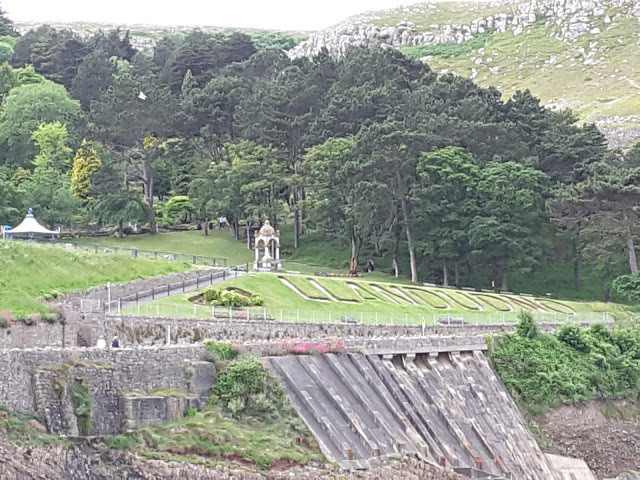 We then make our way around the other side of the Orme, passing a row of very expensive houses known as "Millionaires Row", including property which has belonged to Sir Cliff Richard and goalkeeper Neville Southall to name two. On this side of the Orme there are views over to Anglesey and Snowdonia, before we make our way round to the West Shore, where you can find the white rabbit statue. There are many references to Alice in Wonderland in Llandudno. 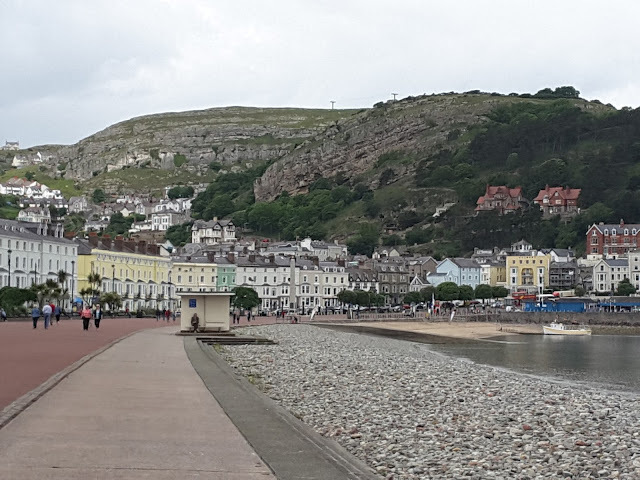 If the myth is to be believed, the "real Alice" who inspired the story, took holidays in Llandudno in the 19th century. 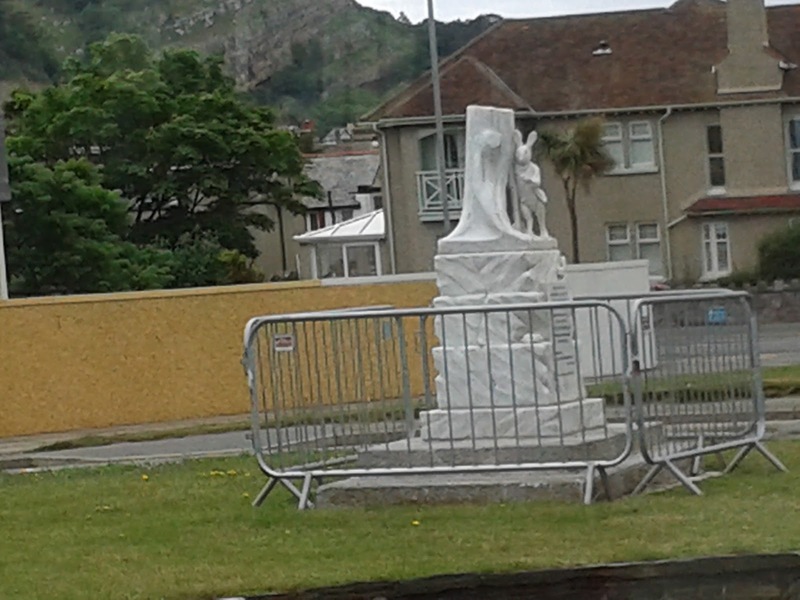 There are statues and references to the story all over Llandudno and you can also follow an "Alice In Wonderland Trail". After the tour, we head back onto the Pier. It's been years since I was on a seaside pier. As a regular visitor to Blackpool as a child, going on the Central Pier was a big part of the holiday. Mum, gran and I would even go to theatre shows at the end of the pier. But as I grew into an adult I developed "pier fear". As a child it didn't bother me, but as an adult, seeing the water underneath the boards sparked off an irrational-but-real fear. However I managed to overcome this and have a trouble-free stroll down Llandudno Pier, where I encounter a new friend. More about him later. 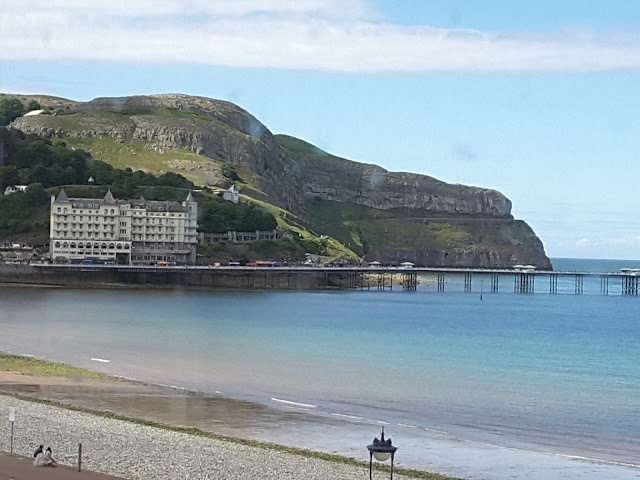 From the pier you can see the Happy Valley gardens which sit at the foot of the Great Orme. Due to time constraints we didn't have time to explore the gardens on this holiday but that's definitely on the 'to do' list for a future holiday here... yes we've already decided that we want to come back here. One thing I have noticed is the number of people who have brought their dogs with them on holiday. There's quite a selection of breeds on the pier today, it's like a mini Crufts! After our coffee at the end of the pier, we stroll back to town, for a late lunch. The pre-holiday research is paying off and this nice little Turkish restaurant in town delivers the goods. 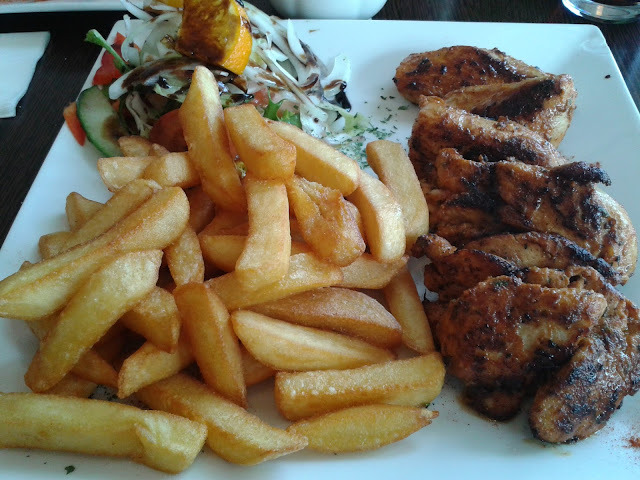 This chicken kebab would turn out to be my favourite meal of the holiday. We do some souvenir shopping in town after lunch. I end up with a couple of new friends. 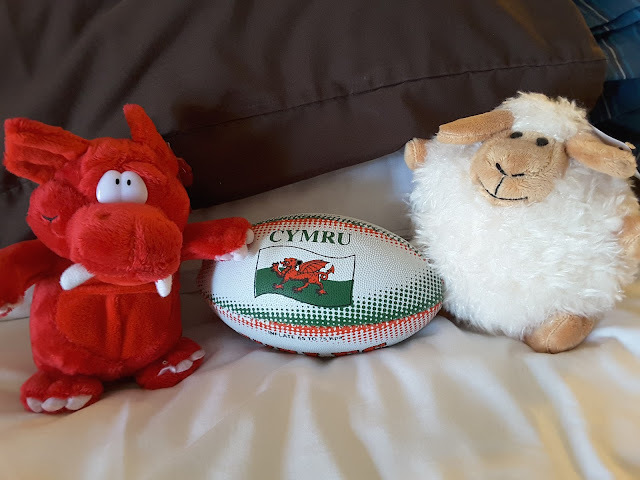 I purchased my little sheep on the pier earlier today, There are many, many soft toy dragons in the various souvenir shops in town, but you know when you've met the one. Tonight we have dinner at an Indian restaurant. Most of the town's restaurants are located on or around Mostyn Street which is the town's main street. There is a cuisine for every taste in Llandudno, although we have noticed that the restaurants aren't too busy at night during the week. This probably has a lot to do with many of the hotels offering bed, breakfast and evening dinner, which means that many of the holidaymakers on full board don't really have any need to frequent the town's good selection of eateries. Llandudno attracts a lot of coach trips for, let's just say "people of a certain age" and the town can resemble a "retirement village" at times. But I don't have an issue with that - after all, if we were a few years older, retired and lucky enough to be in the position to afford a few coach trip holidays, then of course we would be doing that too. I have some older friends who are retired and are lucky enough to have the health, the freedom and the finances to afford this type of holiday, which they really enjoy doing. 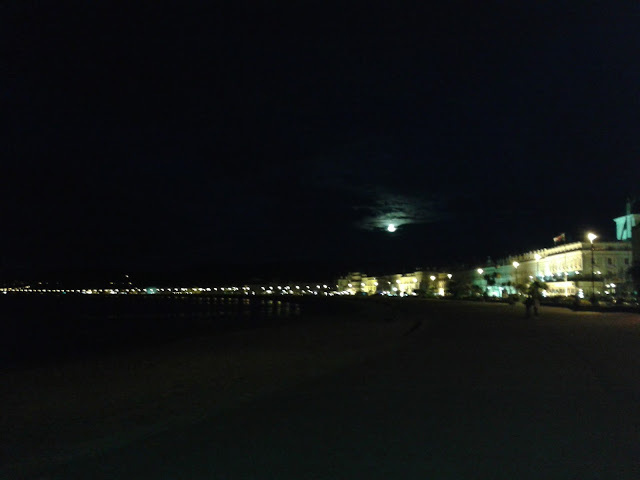 The promenade is deserted again, just after 11.00pm as we end the evening by making our way back to our guest house. In the next instalment....a day trip!